You know how you can pass by a section of your house for years and really not "see" things? It's often easier to just let the piles be. On Saturday, after years of ignoring it and pushing things around, I cleaned the top of my chest of drawers. The space, not very big, was a catch-all for stuff. It's where my cologne sits. I had hair ties and clips even though my hair is a bob now. There's body lotion at easy arm's reach for the times when my legs and feet are cracked and scaly. But there were also photos, lots of photos and other stuff, just stuff. I reached a point, I don't know why, where that space cried out to be cleaned. I sorted through all the photos. I have a large number of Carole taken for prom and homecoming and turnabout, the dance where the girls ask the guys to go. It can also be called a "Sadie Hawkins Day dance" in reference to a Lil' Abner comic strip where Sadie asks Lil' Abner to a dance. You have to either really love comics or be a certain age to know that reference. As much as I like the memories associated with the photos, I decided I didn't need all the framed photos. They are going to Carole. I have other photos of the events which I will keep. The above photo I'm saving. 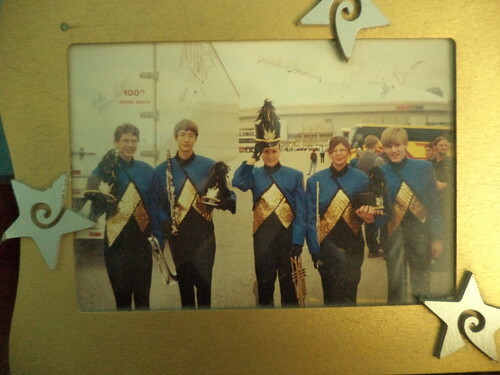 This was sophomore marching band season. Those uniforms were brand new that year. The Wheaton North Marching Band did, and still does, competitive marching band. If you aren't familiar with it, a band develops a show, much longer than a half-time show, with a color guard and on-field marching. Depending upon the length of time you've done this and where you fall in the rankings at shows, you can get an invitation to the regional competition. For us, it was in Indianapolis at the RCA Superdome, which was demolished in 2008. It was breath-taking to walk onto the field behind the kids and then watch them perform. I can't remember for sure, but I think our highest place was 10th overall in our division. The competition is fierce and we saw some amazing marching bands. That's Rob, Marc, Jesse and Colin with Carole. Four of the five of them have stayed in contact with each other. I was a band mom and this photo reminds me of all the stress we went through to get to this point, but, more importantly, all the fun and excitement of watching our kids do something they loved. I found this in the piles on top of the dresser. My mother's pen pal sent this to me many years ago. 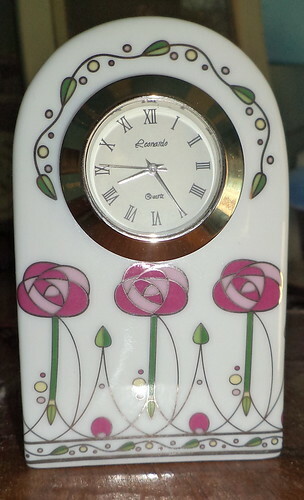 The design is based on Charles Rennie Macintosh, a Scottish artist. It's porcelain. It hasn't worked for years and was in a box at the back of the top of the dresser. I was pretty sure it was simply a matter of replacing a battery, but it could be something else. It's not very big, maybe 4 inches tall, but it's so pretty. I needed to see if it could be fixed. There was another button battery in the box. I couldn't see, at first, how to change any kind of battery until I realized that the clock face can be removed. You can see the face isn't very big. Once removed, I had a devil of a time trying to figure out how to pry the battery out. Then I noticed there is a little clip. When that was pulled, out popped the battery. 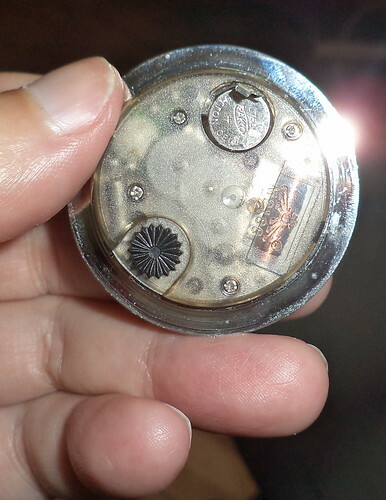 I put the one I found in the box in the vacated spot and the clock started up. That's all that was the problem. It needed a new battery. There was a huge amount of dust on top of the dresser. I didn't take a photo of that. Some things are better left not shown. I tossed so many rubber bands and spent hair ties. I gave away pins and ceremonial buttons for events I don't remember attending. I found all my Scottish jewelry and it's in one box now, not scattered about. I need to shine a silver chain however. That was a bit of a downer to see it had tarnished. But, the area is cleaned and looks so much nicer. I need a container for bills. I always put them on top of the dresser where they are in visual sight so I don't forget to pay something. In rearranging and pitching, I've removed some things the bills would lie against because I am not interested in saving things. I'll find something and I have the perfect spot for it. It's another step in tidying my space and it feels so good.